Visual Processors and Neural Network Accelerators are at the crossroads of image-processing, convolutional neural nets (CNN), machine intelligence, and the emerging augmented reality market. More than just an image processing algorithm co-processor, and more like a powerful subsystem that can take multiple streams of highspeed pixel data and feed a GPU for display, while simultaneously doing data analysis and extraction. The VPNNA is a relatively new device, in fact only one company is making a complete standalone VPNNA core—Verisilicon, but others are on the way. Cadence has three processor cores, the P5 and P6 which are being used in classic VPNNA roles, and we expect them to also produce a CNN optimized VPNNA. which can be used in classic VPNNA roles, and we expect them to also produce a CNN optimized VPNNA. Wave Computing’s Coarse Grained Reconfigurable Array, and Google’s Tensor Processing Unit represent new approaches to neural network training and inferencing respectively. For cloud-based deep learning applications those two are at the top of the class and featured in this edition of the Visual Processors and Neural Network Accelerators Report report. Other VPNNA capable devices like Ceva’s XM4, Inuitive’s NU 4000, and the VPNNA capable processors Intel has acquired recently from Movidus, Silicon Hive, Nervana, and its own remarkably capable Gen9 GPUs are among the 38 companies we have identified that are making VPNNAs capable processors using GPUs, DSPs, and dedicated engines. Thirty-eight companies, with industry giants like Intel, TI, Nvidia, AMD, and Qualcomm, to name a few, don’t get into a market and invest millions of dollars in R&D and acquisitions unless they see a big return. Therefore, no semiconductor, system builder, or software tool, or application developer can afford to ignore this emerging, maybe even explosive, market. JPR’s quarterly Visual Processors and Neural Network Accelerators report will give you the in-depth information you need to access opportunities, suppliers, and competitors. The applications for VPNNAs ranges from super-smart prosumer cameras to automobile license readers at bridges and gateways, to airport security and nozzle monitoring of a satellite launching rocket. With high-resolution cameras being employed in every aspect of our lives, making autonomous vehicles of all types possible, drone surveillance and crop assessment affordable and reliable, and face recognition at ATMs a new normal in our lives, the demand for high-performance front-end processing of the myriad of image-processing functions has never been greater. 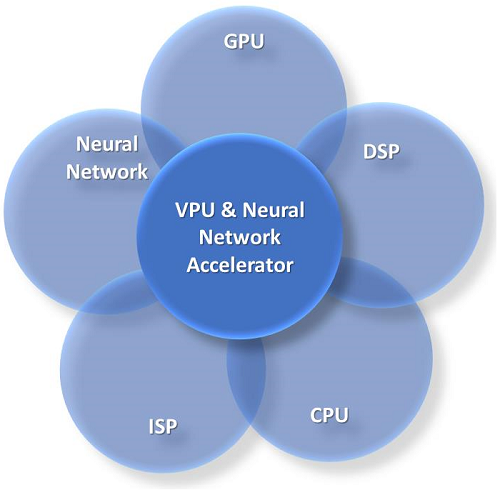 JPR’s new quarterly Visual Processors and Neural Network Accelerators service analyzes the suppliers, the technology, the processors, and the market opportunities. We have identified 20 suppliers of VPNNA, and eight IP suppliers, plus ten start up that haven’t produced any silicon yet.. As robust as the market is, there will be consolidation through either failures or acquisitions, and we think there will be just a half dozen suppliers, three major companies, and three niche players by 2020. Where will your supplier, or your company, or your competitor be in 2020? JPR’s Visual Processors and Neural Network Accelerators report can help you assess those opportunities and threats.